Obsessed with both design and technology, the founders of SPY Optics are committed to producing the highest quality, most functional, best-looking eyewear on earth. 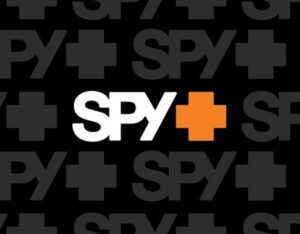 It’s not exactly a traditional business model; in fact SPY prides itself on pushing the conventions of both business and design. As snowboarders, surfers, and racers, these guys embraced the action industries of sports that cross all boundaries of speed and performance. KEN BLOCK – Inspired by the unmatched wheel color and single-spoke accents on Ken Block’s 600hp Ford Fiesta, mix-and-match custom-color temple variations are further accented with asymmetrical tip colors on the left temple, and every pair comes with a free bonus set of temples. AFTERGLO – Digital shamans conjure up rhythmic grooves, guiding the pulsing clique toward nirvana. Matte pop colors and dazzling Spectra® mirrors engage the senses. Open you eyes, free your mind, and feel the Afterglo. PERFORMANCE – Streamlined styles in bold, affecting colors and technological advances like a patented scoop ventilating system highlight models from the Performance Line. DALE JR. – The Dale Earnhardt Jr. Signature 88 eyewear collection complements the lifestyle of this modern-day American hero. The all-new General, and Dirty Mo, McCoy, and Quanta frames feature Dale Jr.’s pad print 88 signature logo on the inside temple. SWEETEST THING – Wrap your eyes in a confection of caramel-coated fronts and cotton candy temples, and peer through lenses as refreshing and sweet as peppermint sticks. REALTREE – SPY collaborated with Realtree® – innovator and manufacturer of the world’s most versatile camouflage patterns – to come up with a super-stealthy line developed for both athletes and outdoorsmen wearing protective eyewear or sunglasses to help ensure unobstructed vision in all conditions. KEEP A BREAST – SPY is happy to offer firm support to Keep A Breast, collaborating on several voluptuous SPY + KAB Limited Edition sunglasses and both snow and MX goggles. WHITEWALL – There was an era decades ago that fostered the emergence of rock ‘n’ roll and teenage rebellion. Icons are forever, and classics never die. This is the Whitewall Collection. Stop by Rx Safety for great deals on SPY Optics glasses, and stay safe in style.